You are here: Home » GENRE » Scifi » Godzilla: King of the Monsters (big trailer). Godzilla: King of the Monsters (big trailer). 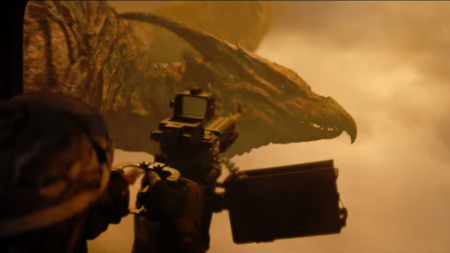 There’s a new trailer for the Godzilla: King of the Monsters movie – it’s big, mainly the monsters, but the trailer too, I guess. Godzilla (film review by Frank Ochieng). Godzilla: new trailer is thoroughly monstered. Godzilla! Will this movie be . . . monster? Godzilla (2014) (a film review by Mark R. Leeper). « Australian science fiction writer T.R. Napper joins the John Jarrold Literary Agency.